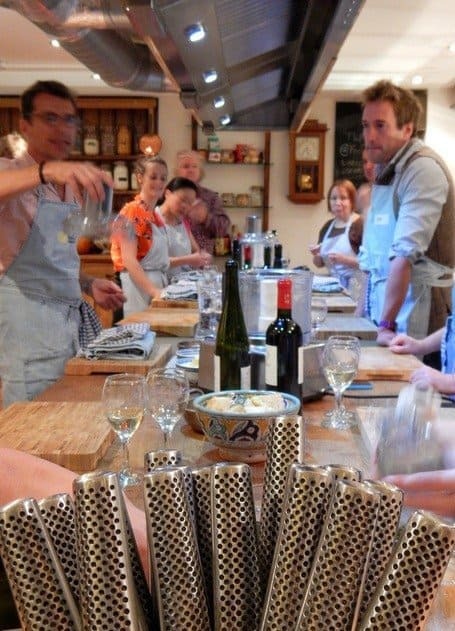 The last thing I expected when I started my blog was to find myself baking biscotti with the very charming Ben Fogle but that’s exactly what happened this week. I was invited to London to the über cool Hoxton Hotel by Celebrity Cruises. 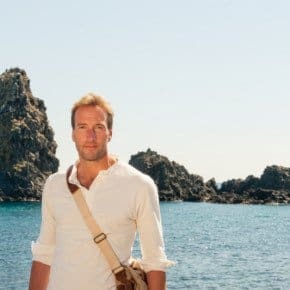 Together with the other ‘Destination Bloggers’ we met Ben, their brand ambassador, and heard all about Ben Fogle’s Great Adventures before heading off to cook up a Sicilian Feast. Ben’s designed some new adventurous shore excursions enabling guests to really dig deep into the destinations they’re visiting. They can now do so much more than just take look at the place. 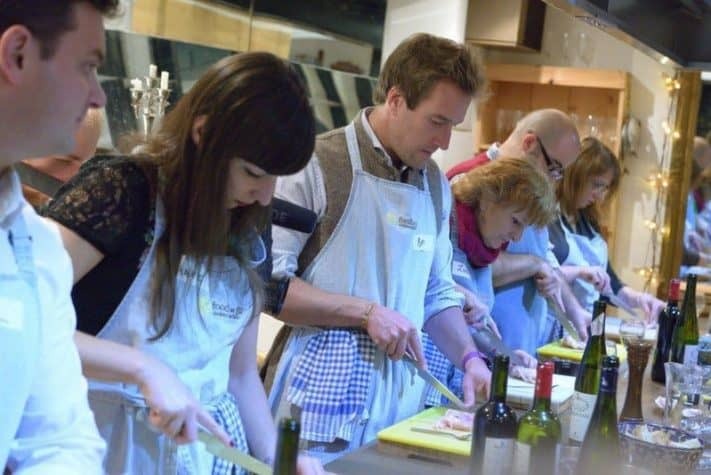 Tours include creating your own flavour gelato in Sorrento, Kayaking the Stockholm Archipelago and taking a Sicilian Gastronomic Tour and Cooking Class. 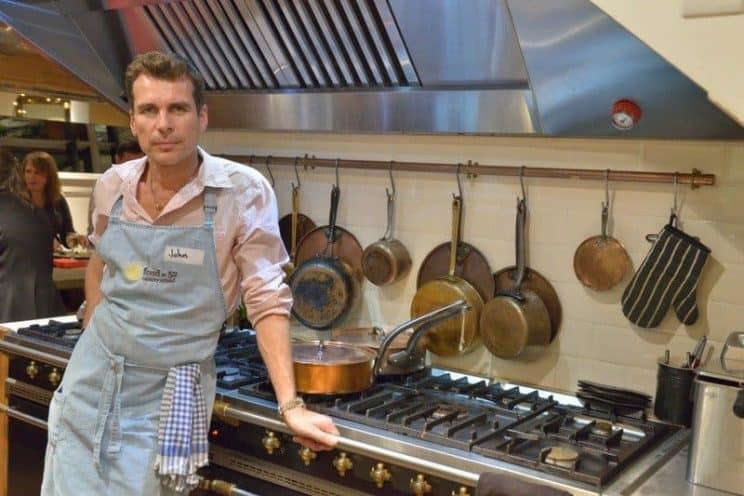 I actually experienced Ben’s Sicilian Gastronomic tour and cooked up a Sicilian feast the following year – read about it here. We started the day with a round table meeting with some of the Celebrity Cruise executives and their marketing company. 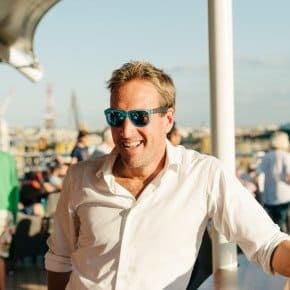 Ben described, with great enthusiasm, the new excursions he’s created for Celebrity Cruises and after lunch we had a few nerve-wracking minutes to interview him. Even after all this excitement the day wasn’t over and in the evening some of us set off to [email protected] for a cooking class. 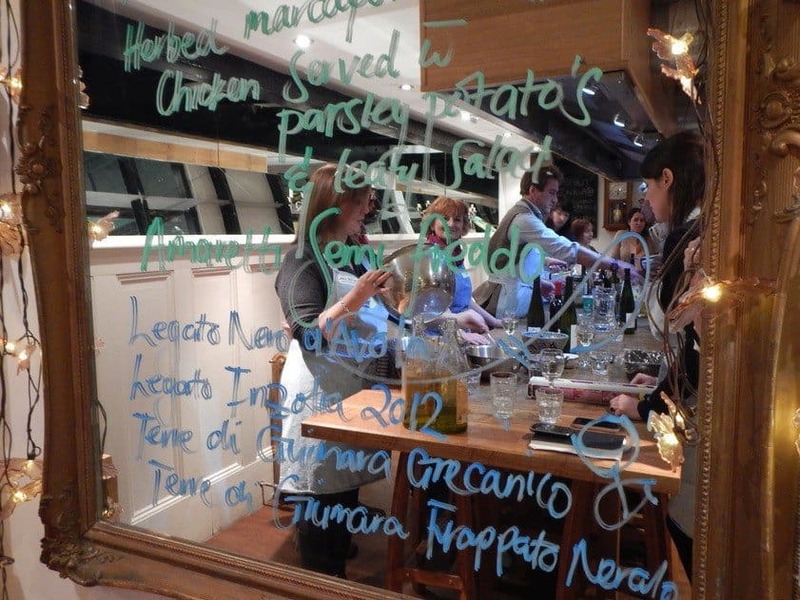 We immersed ourselves in the ethos of the new excursions and really got stuck into some classic Sicilian food. 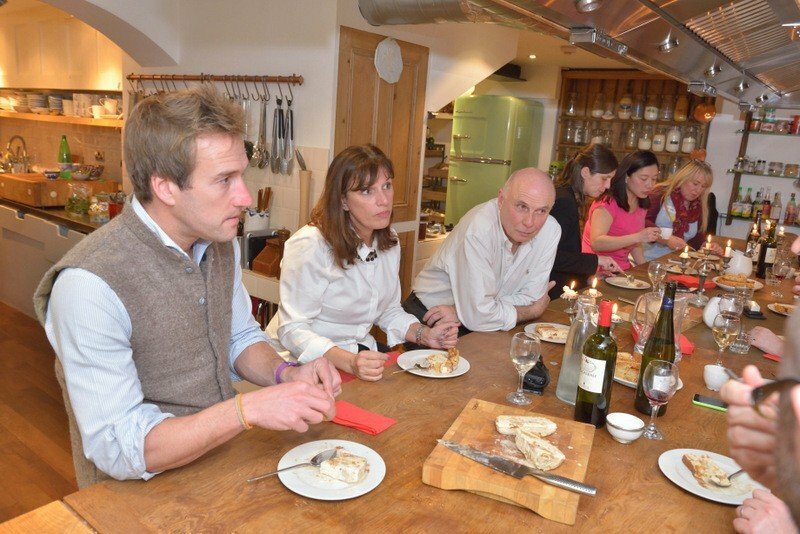 John Benbow, owner and chef, at [email protected] taught us how to prepare his Roast Chicken with herby mascarpone and Parma Ham recipe. It was served up with Parsley Potatoes and Leaf Salad followed by Amaretti Semi-Fredo with Cantuccini (Italian Biscotti). 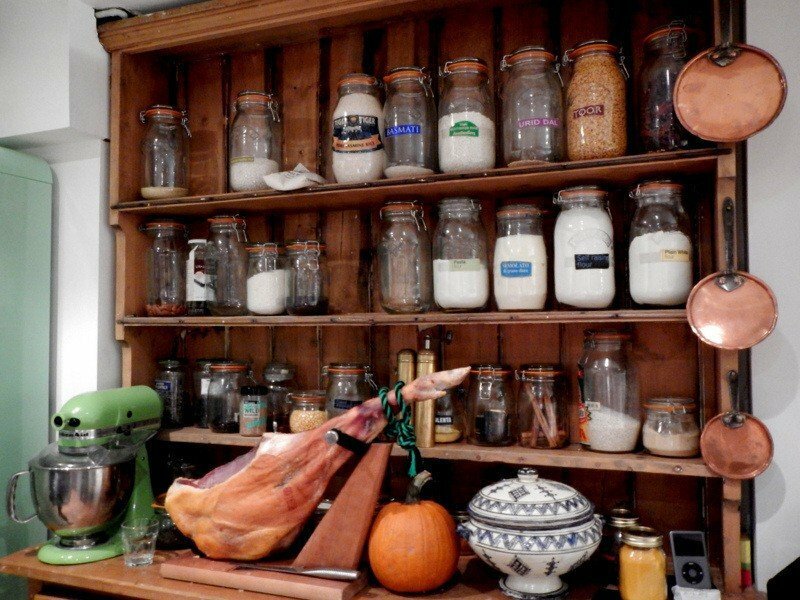 I love to cook and I adored every minute of this class which took place in the [email protected] kitchen adorned with gorgeous copper pans, a dresser filled with jars of condiments, utensils and the biggest stove I’ve ever seen. 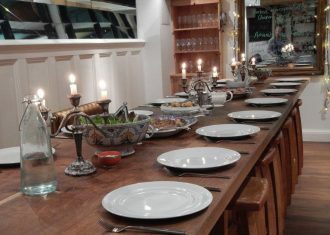 We donned aprons and gathered around a farmhouse style refectory table with the ingredients and utensils we needed all laid out before us. We started off by preparing the biscotti – I didn’t know it but biscotti means twice cooked (bi) and not biscuit as I’d always thought. I’ve shared the biscotti recipe at the end if you fancy trying it out – nice with a morning coffee. 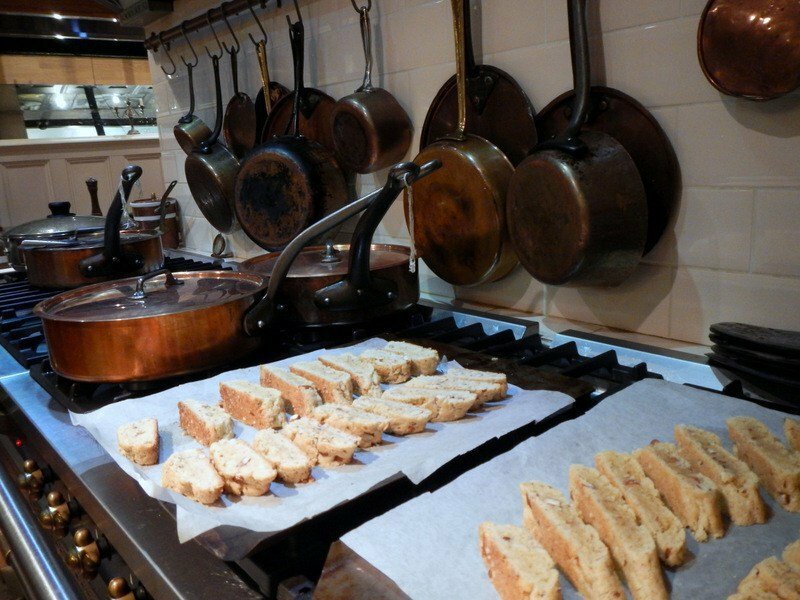 Soft, fresh focaccia were dipped into ceramic bowls of satin-smooth virgin olive oil to tempt our appetites while John explained how to prepare the biscotti. We then followed his instructions and produced our own biscotti, although not as neat a result. These were put in the oven for their first bake while we went on to learn how to de-bone a chicken thigh. Something I’ve never done before but is really useful to know. The thighs were stuffed with a fragrant mixture of herbs, seasoning and mascarpone all wrapped up in mouth-watering Parma Ham. The pan-roasted chicken was served with sauce made from the pan juices and a dash of piquant lemon. While this was cooking we sliced the once baked roll of biscotti dough into bite-sized pieces and popped it back into the oven for its second bake. 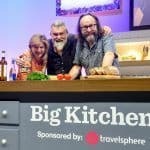 When I’d interviewed Ben earlier in the day I’d asked him if he ever tried to recreate dishes at home that he’d loved on his travels. He confessed that he wasn’t really very good in the kitchen. Judging by the look of his chopped herbs he wasn’t wrong. However, he whipped up a storm in the kitchen along with the double cream for the Amaretti semi freddo desert. While everything was cooking we went back upstairs to the [email protected] chill-out room filled with fabulous cookery books, big squishy sofas and retro furnishings. Stained glass and old-fashioned standard lamps set the scene as we chatted over a glass of smooth Sicilian red. It wasn’t long before some delectable smells wafted up from the kitchen and we eagerly returned to the table to sample our efforts. 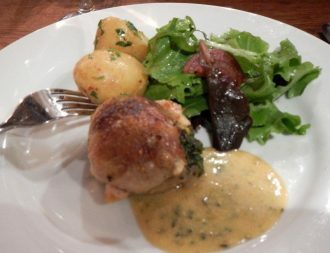 The chicken was tender and full of flavour with the lemon in the sauce complimenting it perfectly, as did the nutty new potatoes garnished with parsley and a fresh leaf salad. Because semi freddo takes six hours to chill properly, although we’d made our own, in true Blue Peter style we sampled one that John had made earlier. 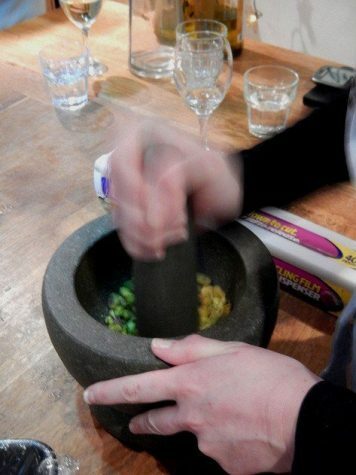 The creamy dessert was jewelled with pistachios, dusted with cocoa powder and finished with a hint of sweet Amaretti. 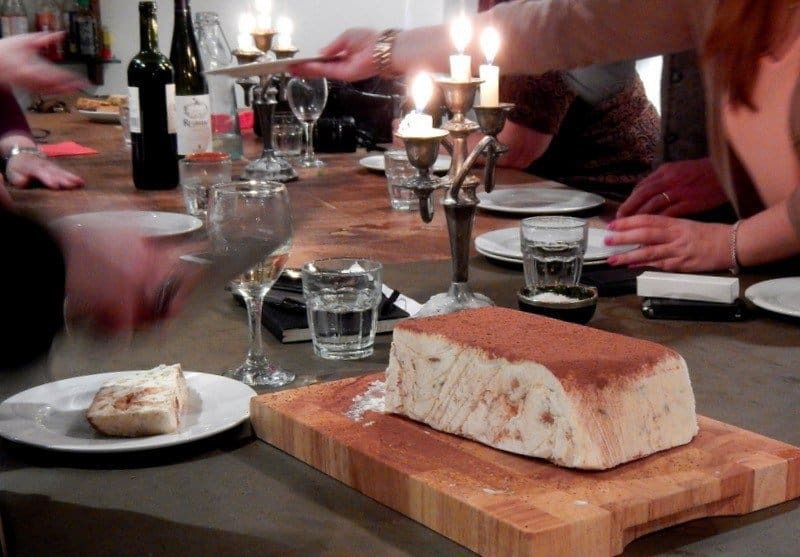 Golden brown crumbly biscotti on the side made it the perfect ending to a gorgeous Sicilian feast. 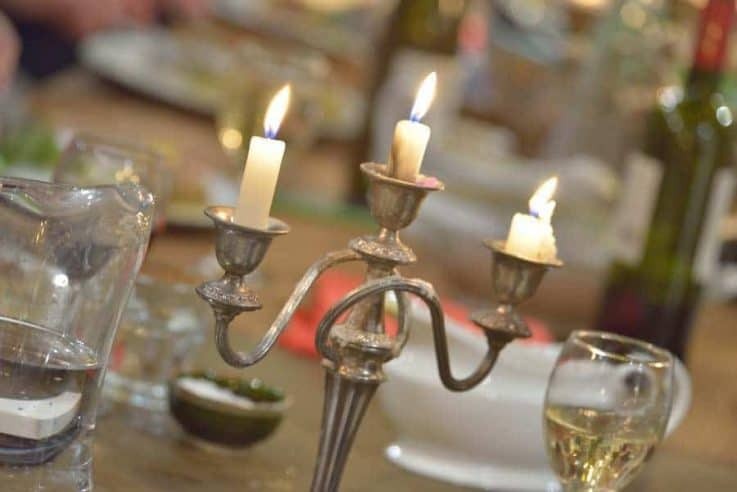 The food was fabulous, the experience a lot of fun and the guests sparkled – an evening I’ll savour for a long while to come. Sift the flour into a large bowl. 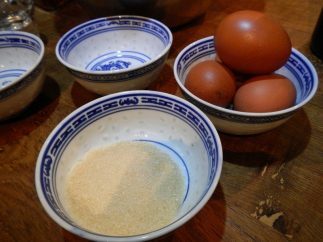 Add the eggs, ground almonds, diced butter and sugar (2 knives slicing together works well to blend in the butter). Form together to bring a dough. Preheat the oven for 180C. Roll the dough into four long sausages on two separate greased baking trays, about the diameter of a 10p piece. Cook for 30 minutes. Slice with a slight diagonal angle, about 1.5cm apart. Turn each slice on its side (while still on the baking tray) and return to the hot oven for a further 5 minutes. Biscotti, something from the passed – while living in Gothenburg and before I started work abroad – I made them weekly. And as you say, so easy to make. But I used hazelnuts in mine. 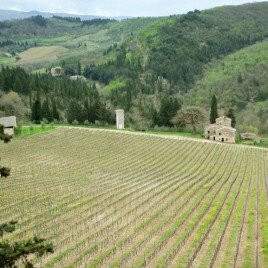 I’m really envy on your day with Ben and this Sicilian Feast. What a great post it’s just like I been there with you guys. I would have loved to attend to something like this. Ben seems to be a man with many talents and interests. Love men that can cook. Suzanne, I love the new layout of your blog, but I have problems to find previous and newer posts or is it only me. Been looking everywhere so I can find what I have missed. Aah! i love Biscoti. These look fantastic. Have never tried making it at home! Now’s the time to try….! Looks and sounds divine, Suze. I’d always thought biscotti meant biscuits too, so thanks for clearing that up. 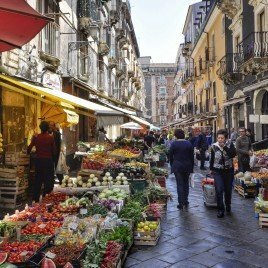 I had some great meals in Palermo – so fresh and tasty, especially the swordfish with pine nuts and pesto – mmmm! That sounds delicious – I feel an Italian meal out coming on! Sounds and looks wonderful! I can almost smell it. 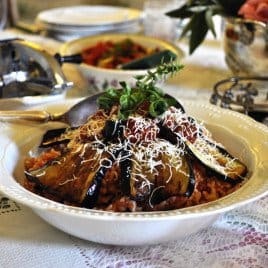 I’ve never tasted Sicilian food but if it’s anything like Sardinian it will be wonderful! Feeling very hungry now! 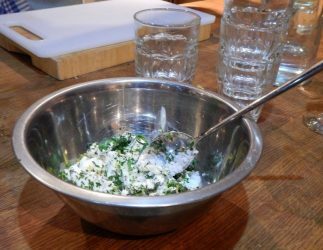 It was delicious Kathryn – will definitely be cooking this at home! Indoor tennis! Nuts but not that nuts!